If you need your horse trained to ride, patterned on barrels, poles, trail course, or just muscled up and back in shape, let me do that for you. I love rodeo and have traveled competing successfully in barrel racing winning state championship titles in Colorado and Kansas, and have qualified multiple times for the pro-rodeo Mountain States circuit finals where only the top 12 contestants in Colorado and Wyoming compete. I have two wonderful children who I am very proud of who have been hauled to rodeos since they were born who were both blessed and talented enough to attend college on full rodeo scholarships. They have each won many championships of their own. Our past champions include "Rocket" who was purchased off the track in the fall of his 3-year old year, and he ran the fastest time of the performance at his first rodeo the following May. He went on to become an outstanding performance horse in barrel racing, pole bending and steer wrestling. Then there was "Francis", who had 60 days of training when we purchased him at a local auction. 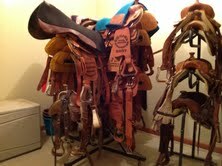 My daughter Dana needed a trail course pony for the Little Britches rodeos and he was the perfect size and temperament. 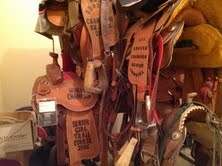 I trained him on the course at home and Dana seasoned him at the rodeos as a Junior Girl. Less than a year after we started him, Dana and Francis won Reserve World Championship and went on to win two World Championships and another Reserve World Championship title in the Junior and Senior divisions. Then there was a mare we purchased at a bargain price and named "Flip" because she had become arena sour and dangerous in rearing and refusing to enter the arena. She was already well trained in barrels and poles, we just had to fix the part about getting in the arena. Less than a year after she came to us, she carried Dana to a Reserve State Championship in Pole Bending, and a State Championship in Goat Tying in the Colorado State High School association.